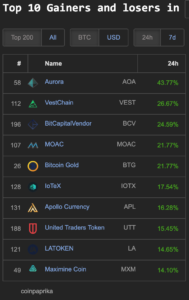 Bitcoin (BTC) is trading at 5016 USD just above the 5k psychological level— still maintaining 22% gains from the last 7 days. 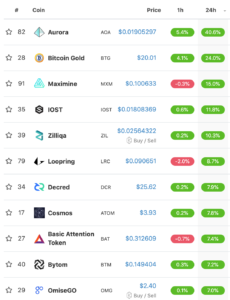 coingecko.com has 5 coins gaining double digit percentages in the top 100 market cap in the last 24 hours: Aurora (AOA) 44%, Bitcoin Gold (BTG) 47%, Maximine (MXM) 15%, IOST 11% and Zilliqa (ZIL) 10%. 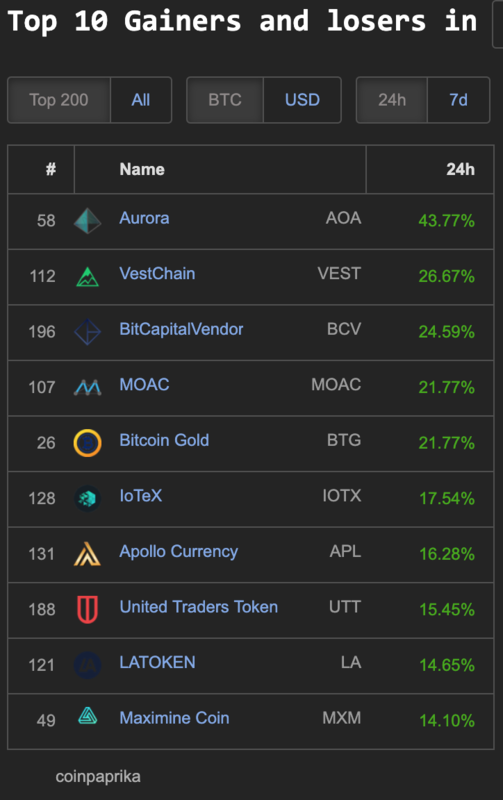 Aurora (AOA) 43%, VestChain (VEST) 26%, BitCapitalVendor (BCV) 24%, MOAC 21%, Bitcoin Gold (BTG) 21%, IoTex (IOTX) 17%, Apollo Currency (APL) 16%, United Traders Token (UTT) 15%, LATOKEN (LA) 14% and Maximine Coin (MXM) 14%. 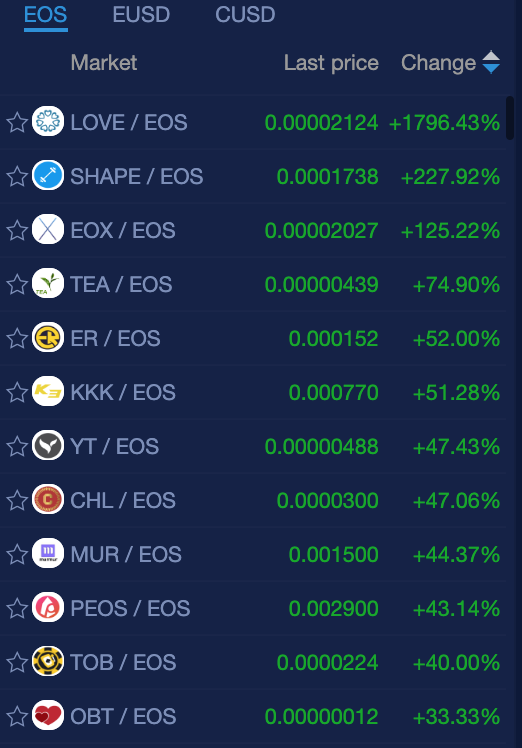 EOS platform coins & tokens have some 3 & 4 digit percentage gains: LOVE (1796%), Shape (227%), and EOX (125%). 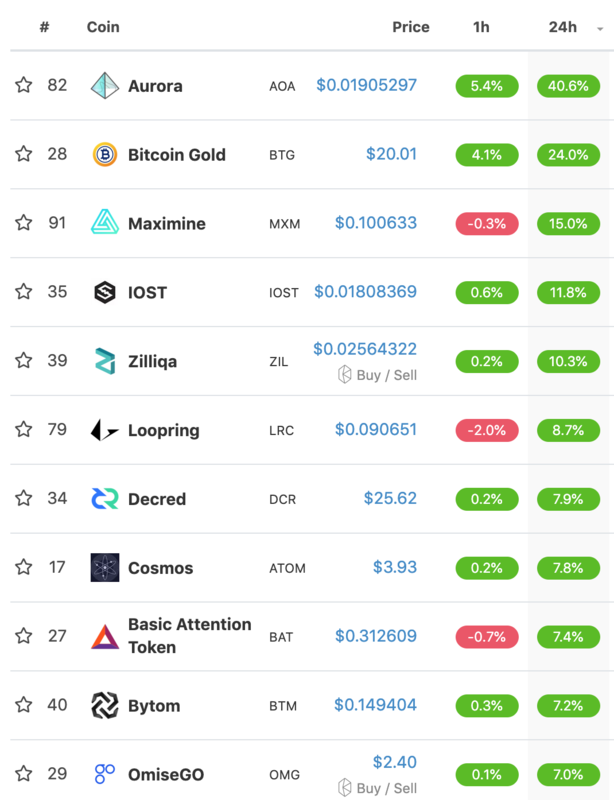 There are also 25 other coins gaining double digits—some of those non gambling coins/tokens include: TEA (74%), YT (47%) CHL (47%), MUR (44%), PEOS (43%), OBT (33%), POOR (32%), ZKS (31%), BRM (27%), OCT (20%), LYNX (20%), ADD (19%), INF (17%), EBTC (17%), NDX (13%) and CET (10%). 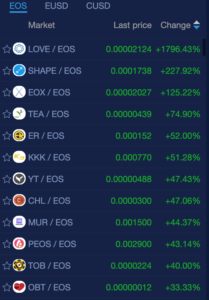 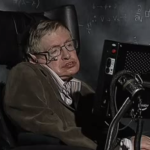 Congratulations to holding these coins/tokens today!